Derby boss Gary Rowett has admitted he's weighing up a potential loan move for Pompey target Jamie Hanson. 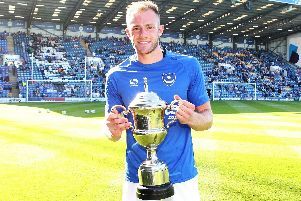 The 22-year-old midfielder is wanted by the Blues as manager Kenny Jackett bids to bolster his depleted midfield ranks. Danny Rose (broken leg) is likely to be out for the remainder of the season, while Stuart O'Keefe has been earmarked for an April return following a hernia-type operation. Yesterday, Pompey brought in Spurs youngster Anton Walkes for the remainder of the season, with the 20-year-old able to play in midfield. But that hasn't stopped the Blues' pursuit of Hanson, who has been offered a new deal at Pride Park. Rams boss Rowett said he was keen for the player, along with team-mate Mason Bennett, to go out on loan. Hanson has made just one substitute appearance this season. However, with Derby currently without Bradley Johnson (back) and Joe Ledley also recovering from a back injuiry, they are reluctant to leave themselves short in that department. Rowett told the Derby Telegraph: 'We have had loan enquiries for Jamie and Mason that would give them good game-time in the positions they want to play. 'In an ideal world I would love them to go out and get some football, but at the same time we have to do what is right for us. Derby, who sit second in the Championship, are in action tonight against Millwall.